As we pointed out in an earlier article, the economic situation surrounding wheat production is particularly tenuous. Today wheat prices are very low and the economics of producing wheat are particularly poor. In some areas of the Great Plains cash wheat prices are within cents per bushel of cash corn prices. For instance, you can see the Kansas bids here, Nebraska here. This situation made us wonder about wheat price levels and the value of wheat relative to corn has evolved over time. To look at these issues we rely on monthly national cash price received data from the USDA. We won’t bore you with a lot of details on how these prices are estimated but for those interested in such things you can find the details here. These monthly price received data is meant to reflect the prices that farmers actually receive for their commodities. However, it is an average across the country. This means that the actual amounts received will vary according to local market conditions, but still these prices are meant to reflect an average for the commodity. Both wheat and corn prices have fallen considerably in recent years. The national average monthly cash price for wheat is shown in Figure 1. Because these prices span 1970-2016 we have converted them to real prices using the CPI. 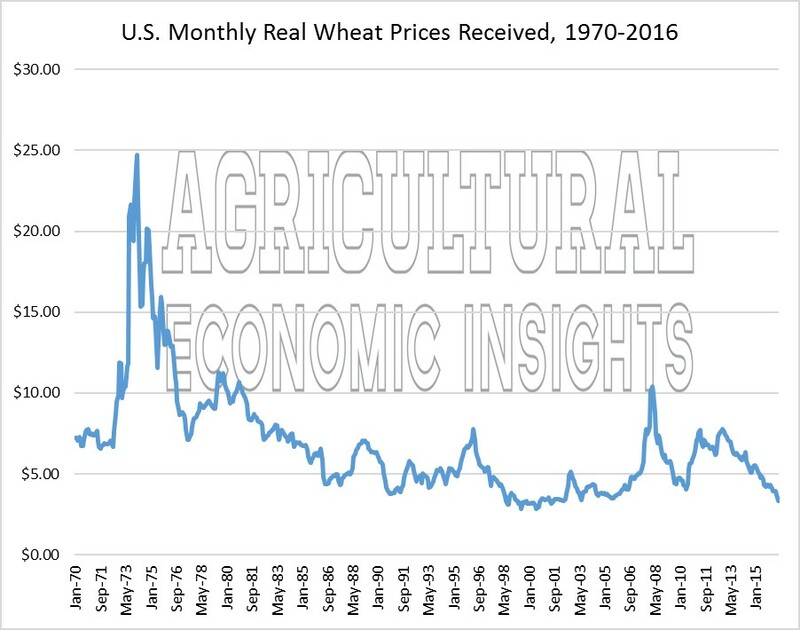 As is obvious from the chart, real wheat prices have not approached anything resembling the highs of the 1970’s. That boom period for wheat prices lasted roughly 5 years, from 1972 to 1977. Figure 1. U.S. Monthly Real (2009) Wheat Priced Received, 1970-2016. The initial boom was followed by a recovery that lasted until 1982. From that point prices have generally trended lower with rebounds in the late 1980’s, mid 1990’s, and most recently in 2007 and 2011. Today, real prices are as low as they have been since a three-month stretch in 2001. Since 1970 monthly real prices have only been lower 22 times or 4% of the time! All of those instances, occurred from 1998 to 2001. Clearly, wheat prices are low in a historical context. Real corn prices are shown in Figure 2. Just as with wheat prices, corn has also trended lower. The same spikes that are apparent in the wheat chart are also seen in the corn chart. Again, the previous boom of the 1970’s provided prices much higher than any seen in the most recent boom. Today, corn prices have also fallen from their recent highs. However, they have not fallen as low relative to previous prices as wheat. For example, corn prices have been lower than today’s prices about 25% of the time. Many of these lower prices occurred from 1998-2007. More recently, prices were below today’s levels in late 2014. Figure 2. 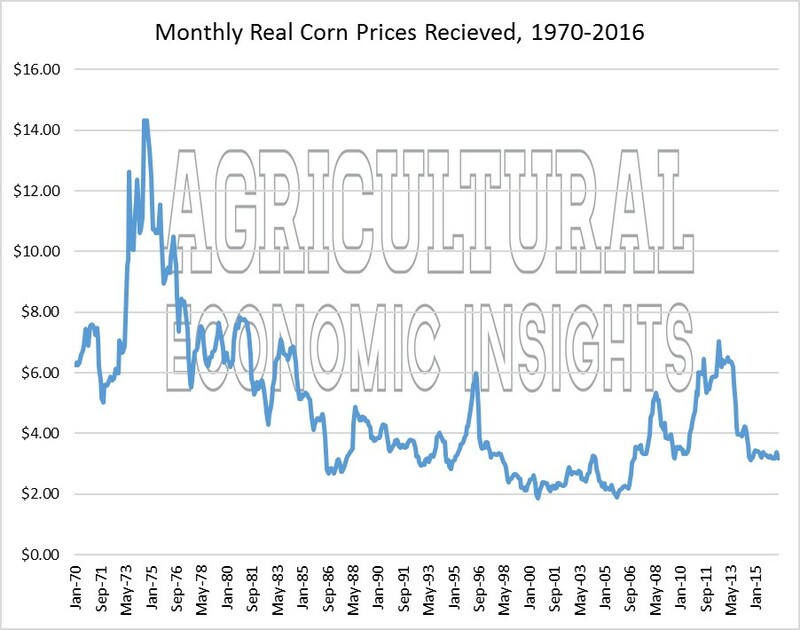 Monthly Real Corn Prices Received, 1970-2016. Corn and wheat are clearly not perfect substitutes. However, both can be used in many of the same applications, most notably livestock feeding. It is just that it is not very common that higher quality wheat is fed to livestock. Given that there is some substitutability between the commodities both by end-users and the farmers that can grow either crop, one should expect to see some relationship between corn and wheat prices. In much the same way that we can look at the soybean to corn price ratio, we can also look at the wheat to corn price ratio. This ratio is shown in Figure 3. From 1970 to 2016, the average monthly level of the ratio is 1.4. The ratio of wheat to corn prices currently stands at 1.04, meaning that wheat and corn prices are nearly equal. Like the level of wheat prices, its price relative to corn is very low in the context of history. The ratio has only been lower than its current level 21 times since 1970, again about 4% of the time. Figure 3. Monthly Ratio of Wheat to Corn Prices Received, 1970-2016. The different cropping seasons of these crops makes a simple analysis of the ratio somewhat difficult. Those more analytical types reading this may wonder if the lows in the price ratio are driven by seasonal crop patterns. In other words, does the ratio bottom as the new wheat crop hits the market in July and peak when the new corn crop comes to market in October/November? Indeed, investigation of the chart seems to show some seasonal tendencies. The average of the ratio in July is 1.29 versus its July 2016 level of 1.04. 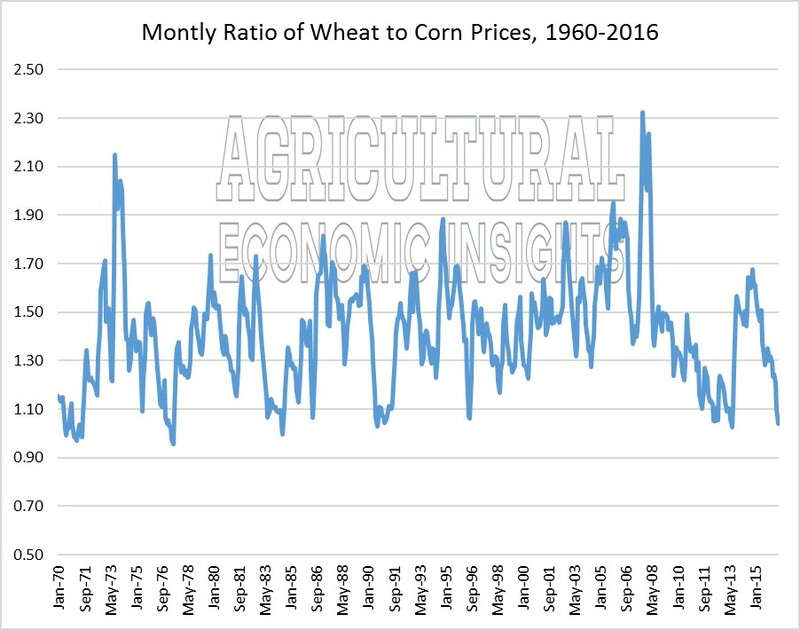 Since 1970, the July wheat to corn price ratio has been lower than the current level 4 of 47 times or about 9% of the time. If one considers the same ratio in March of every year, the ratio has been lower 8 of 47 times. This would paint a slightly less negative picture of the wheat price situation, but it would still remain low by historical standards. So how low are wheat prices? The current level of wheat prices are indeed quite low. They are low both when compared relative to historical wheat prices and relative to corn prices. Today, cash prices are among the lowest seen in the last 46 years. The last time they were this low was in the late 1990’s and early 2000’s. Wheat prices are low relative to corn prices. Again, this ratio is at nearly its lowest level in the last 46 years. Where prices go from here will go a long way to determining what happens with wheat acreages in the years to come. At present it is difficult to get excited about planting a wheat crop when prices are well below economic break-evens, and in some cases not high enough to exceed the variable costs of production. The deteriorating situation in wheat production also provides a warning for corn and other substitute crops. At present it is a bit early to forecast corn planting intentions for 2017, but with the level of wheat prices, we can assume that corn won’t lose many acres to wheat in 2017.